Benefits of the Absa Revolving Loan include not having to re-apply when additional funds are needed. Clients can access funds without affecting their monthly repayments. This loan option comes with fixed interest rates and it gives clients access to an on-going loan facility of more than R15 000 (up to R150 000.) Clients are afforded the opportunity to pay their loan off faster, as additional deposits are accepted as capital reductions. An affordable Credit Protection Plan is also included, which settles the outstanding balance if the client dies; becomes permanently disabled or contracts a dread disease. A monthly amount of 3% of the total insured will be paid for a limited period if a client is retrenched or temporarily disabled. Interest rates are based on individual risk profiles and the loan has a roll-over ability, so a client can take up another loan if the first loan is completely repaid. What is needed for application? Applicants must be South African citizens with a valid I.D, and at least 18 years of age or older. They must be permanently employed, earning a salary of R8000 or more per month. They must be existing Absa clients. There are no face-to-face interviews or countless application forms to fill in. Applicants simply need to visit their nearest Absa branch to apply. 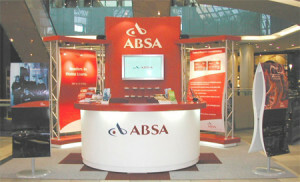 Visit www.absa.co.za or call 0860 100 372.